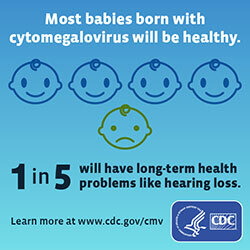 Moms/Caregivers/Teachers of toddlers at greater risk for cytomegalovirus (CMV), #1 birth defects virus, more common than Zika. Blog by Lisa Saunders, leader, Child Care Providers Education Committee, National CMV Foundation. A former licensed child care provider, Lisa didn’t know her occupational risk for CMV until after her daughter was born severely brain damaged from congenital CMV. 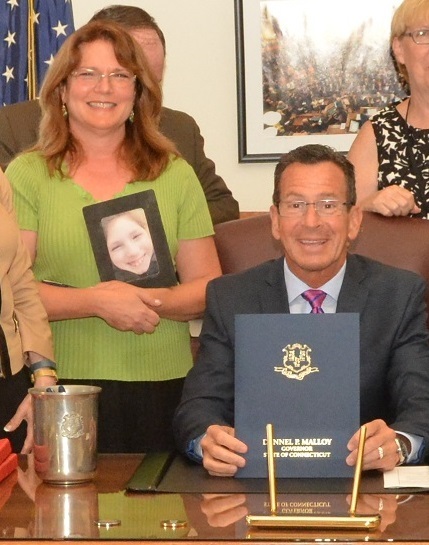 Lisa helped Connecticut pass a CMV testing law, but CMV prevention remains little known. 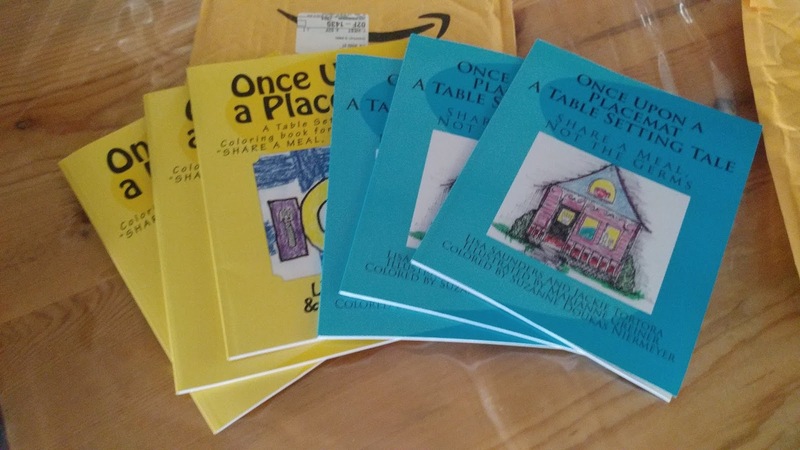 New color version of "Once Upon a Placemat: A Table Setting Tale"
Read aloud the fairytale, "Once Upon a Placemat: A Table-Setting Tale" by Lisa Saunders and Jackie Tortora, with the children in your care then share a meal together. Help the children wash their hands and set their place setting by referring to the tableware characters. Teacher/parents can say things such as, "Remember, Mr. Knife is afraid the dish will run away with the spoon, so put his teeth toward Mr. Plate" and "Miss Cup hates it when people share her without giving her a bath first because of those naughty germs." Staff can work it into STEAM (science, technology, engineering, art and math). STEAM is a popular way to package and present the interconnectedness of Science, Technology, Engineering, Art and Math in the regular curriculum. 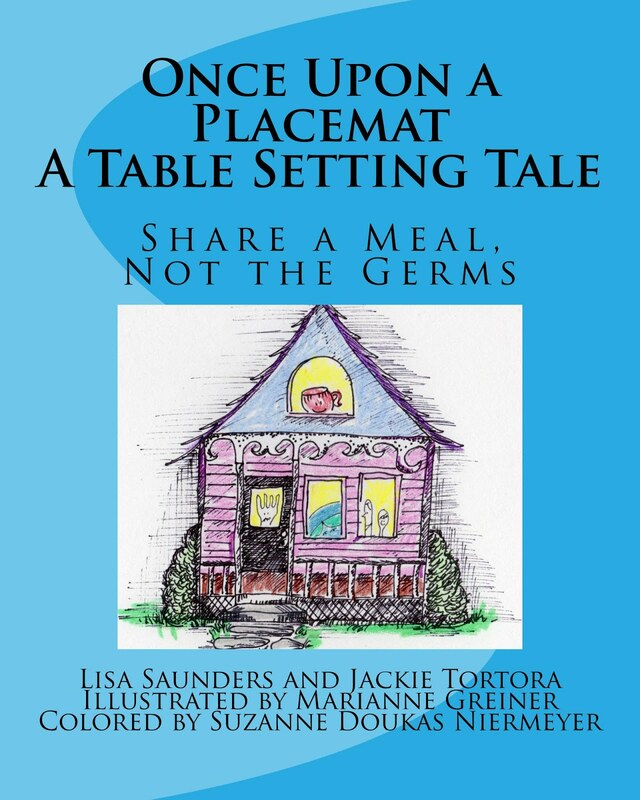 When you talk about germs, the coloring book, “Once Upon a Placemat” (Art and Literacy), introduces germs (science, biology) in a format that integrates the arts. Drawing and writing activities can be planned to further integrate those domains. Teachers can further bring in technology and engineering by designing activities that help the children to "invent" equipment or machines to help better wash hands, keep food fresh and germ free, etc. Math can enter into the plan by graphing how long children wash their hands, how often they wash their hands, how many uses the classrooms get out of a single pump bottle of hand soap, etc. With a little more thought (and a few trips to Pinterest! ), lots of germ-based activities can be created and integrated. Bag (paper or reusable insulated bag). Plate, cup, napkin, fork, spoon, knife. Placemat with tableware characters, which can be laminated (see below for links*). Picnic food (homemade or prepackaged that would use all utensils, such as peanut butter, crackers, applesauce and cake). Hand sanitizer or sanitizing wipes. 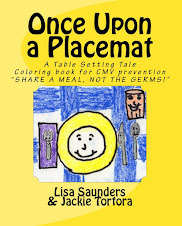 If funds are available, give a child their own bound copy of the coloring book version of “Once Upon a Placemat: A Table Setting Tale,” or the 2nd edition with images already colored, to share with their families so their parents can reinforce the table-setting lesson and learn how to prevent CMV, the leading viral cause of birth defects virus, as well as other diseases. · Educational Coloring Book: Contact LisaSaunders42@gmail.com for a free pdf version of Once Upon a Placemat: A Table Setting Tale (or the educational fairy tale can be purchased as a bound coloring book on Amazon, Createspace or AuthorLisaSaunders.com). Side one: Placemat with tableware characters with space for your coloring artist's name (perfect for laminating and using as a table-setting reminder). Side two: Germ prevention tips and hand-washing instructions. · Video: Short introduction of the tableware characters by Lisa Saunders, the parent representative of the Congenital Cytomegalovirus Foundation. Dr. Rebecca Cihocki, Audiologist, Scottsdale, Arizona. "The lesson of how to set a table is valuable as this is part of encouraging a family to sit down and eat together—a main intervention in preventing obesity." Alison Dvorak, MS, RDN, CDN, Franklin, Connecticut. 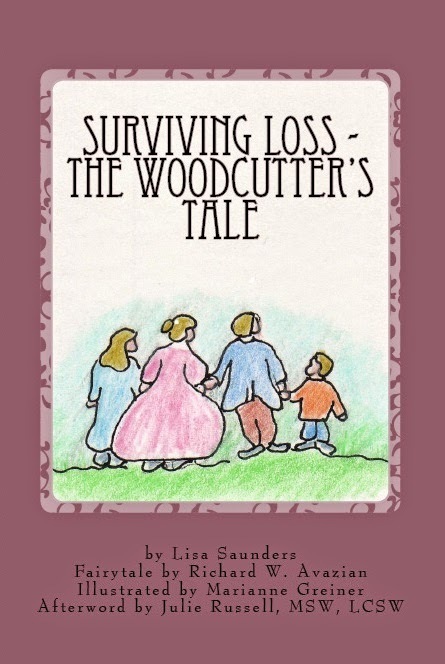 "Lisa Saunders is always such an entertaining author. Her audience not only gets to enjoy a clever fairytale, but gets to learn important life lessons on how to protect babies from congenital CMV and other infections." With you being shy and all it looks like you would benefit from a job where you're interacting with people on a daily basis. You will get your wages but also something much more valuable - experience with people and believe me it helps. By Debra Lynn Alt. 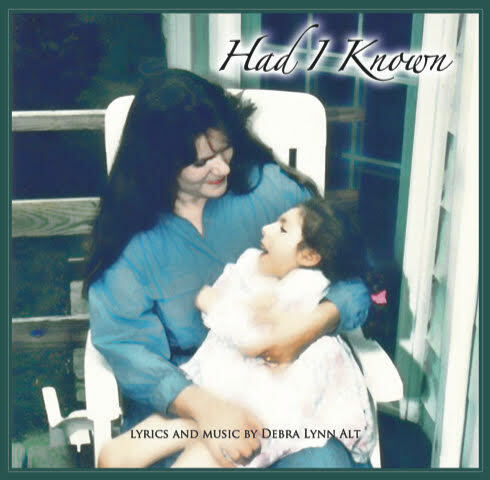 A song about a mother wishing someone had told her how to prevent CMV from disabling her child. Available as free e-book or in softcover from Amazon. Elizabeth on last family vacation with big sister. 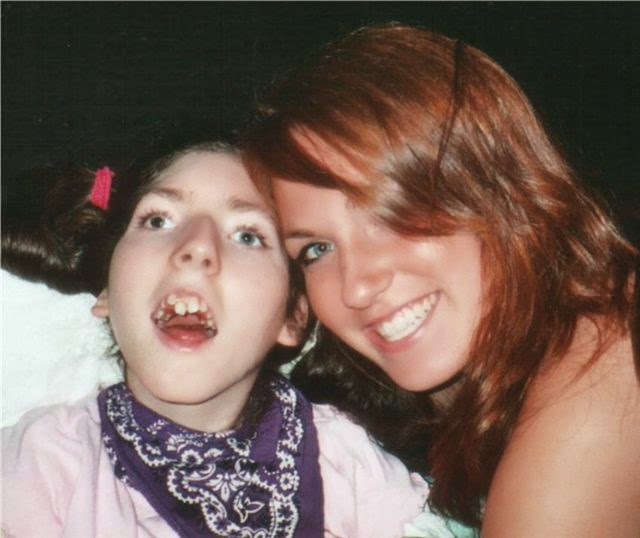 Elizabeth died 2006 at 16 during cCMV-related seizure. Newborn Screening for CMV Found Cost Effective Interview for MedPage by Dr Sanjay Gupta "Gupta Guide"
CMV Contacts for Connecticut, Utah and U.S.
Read Excerpt of Anything But a Dog! 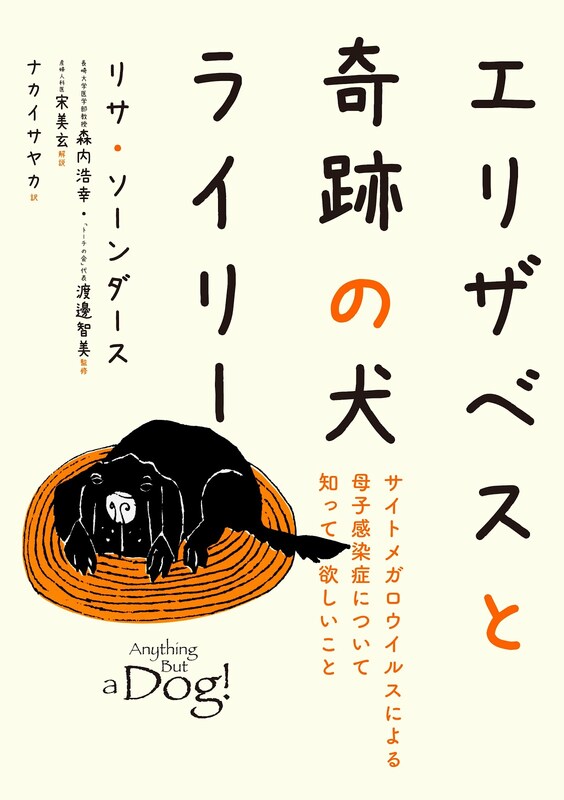 : "LOOK INSIDE"